Over an appropriately dark and stormy morning, Hong Kong Disneyland held the grand opening ceremony for Mystic Point, the final chapter of the park’s multi-year expansion project. 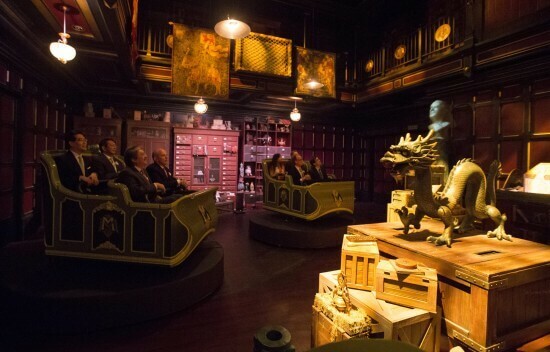 The area, including its mesmerizing Mystic Manor dark ride, officially opens to the public a day later on May 17, 2013. Officiating the grand opening ceremony today were Financial Secretary of the Hong Kong Special Administrative Region John Tsang, President and Managing Director of Asia Walt Disney Parks and Resorts Bill Ernest, Imagineer Joe Lanzisero, Oscar-nominee and Mystic Point soundtrack composer Danny Elfman, and Managing Director of Hong Kong Disneyland Resort Andrew Kam. “Today we mark the completion of Hong Kong Disneyland’s current expansion project on a high note with the opening of Mystic Point. This one-of-a-kind themed area has never been seen in any of our Disney parks worldwide,” said Bill Ernest.“For the first time, guests can immerse themselves in a unique adventure of theatrical wonders that combines traditional storytelling with innovative technology and special effects. The ‘Mystic Magneto-Electric Carriage’ in Mystic Manor is by far the most sophisticated ride system in Disney’s history. Hong Kong Disneyland executives and officials board Mystic Manor. Grand opening ride of Mystic Manor. The story of Mystic Point follows the adventures of eccentric explorer and art collector Lord Henry Mystic, who invites guests to board the Mystic Magneto-Electric Carriage for a tour of his private museum located within his Victorian manor. When Lord Henry’s companion, his monkey Albert, mischievously opens a newly acquired magical music box, the enchanted Music Dust within is released and, accompanied by a haunting tune, a mysterious journey begins. 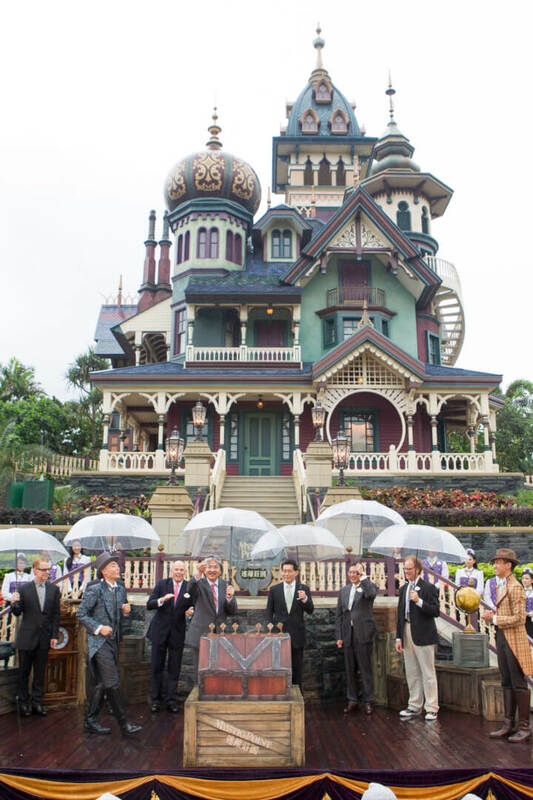 Earlier this week, we took a much closer look at the story behind Mystic Manor, including in-depth interviews with the Imagineers who created the Haunted Mansion-inspired attraction for Hong Kong Disneyland. In addition to Mystic Manor, Mystic Point is comprised of a themed photo area called Garden of Wonders with mystifying 3D illusions, the Explorer’s Club Restaurant, which offers international cuisines ranging from Korean and Japanese to Halal food in exotic surroundings, The Archive Shop, where guests can purchase exclusive novelty items and collectibles, and the Mystic Point Freight Depot, where Lord Henry’s grandnephews share with guests stories from their adventures with Lord Henry. To celebrate the opening of Mystic Point in Hong Kong, a creative advertising campaign will be launched to bring viewers on a journey to unlock the mystery of Mystic Point. In addition to traditional advertising medium such as TV, print and out-of-home media, the resort will also leverage interactive media to create an innovative communications strategy to entice consumers to visit Mystic Point. These include an online video with illusions and surprises to netizen, a TV program allowing viewers to interact using their smartphones and the use of convenience store displays as interactive gallery walls. With the addition of Toy Story Land in 2011, Grizzly Gulch in 2012 and Mystic Point this year, the size of Hong Kong Disneyland has increased by almost 25%, further enhancing its appeal with over 100 attractions, entertainment facilities and shows. 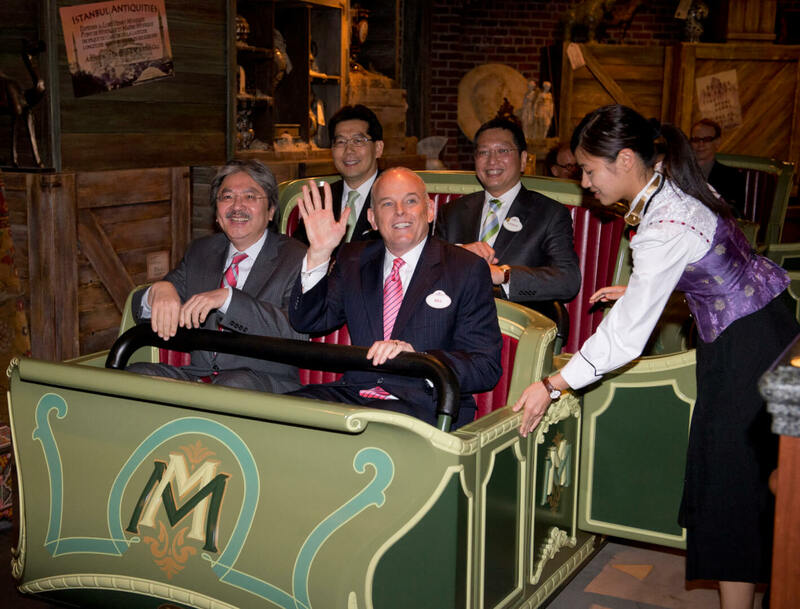 “The successful completion of the three new themed areas marks a milestone for Hong Kong Disneyland and the travel industry. We are confident that Mystic Point, along with Toy Story Land and Grizzly Gulch, will be the key drivers of growth for our Resort. As Walt Disney once said, ‘Disneyland will never be completed as long as there is imagination left in the world.’ The same applies to Hong Kong Disneyland, which will continue to grow, contribute to Hong Kong’s economy and create countless magical experiences for guests of all ages and origins,” said Andrew Kam. Experienced the attraction a week after opening 10+ times. The best storyline build from entrance, thru the queue, and pre-show of any Disney attraction on Earth, a solid original storyline tie-in with SEA (Society of Explorers and Adventurers) started at Tokyo Disney*SEA* and Harrison Hightower, one of the top musical scores of any Disney attraction by Danny Elfman, an amazing ride system which rivals TDL’s Pooh’s Hunny Hunt and one-ups it given that the carriages can twist on the base while being GPS driven on a trackless system, superb special effects and AA scenes, a restaurant next door that continues the storyline of SEA and nods to the defunct Adventurers club from WDW, and it never has a line (typical of HKDL it was a 5 to 20 min wait with no FP offered). There were some RIDICULOUS budget cuts made that reared their ugly head in many instances in the ride and in the land. The worst offense being a fully functional built-out train depot at Mystic Point next to the train track that does not load passengers because the train cars face the wrong direction (TOTAL FAIL – They should have moved the station or put in a tunnel). Overall, it’s a crown jewel in the Disney attraction lineup only inline with 3 other attractions being Radiator Springs Racers (DCA), Pooh’s Hunny Hunt (TDL), and Grizzly Gulch Runaway Mine Cars (also in HKDL – same ride system and cars as Everest but 4 times better with 3 full AA scenes and 3 faster track switches to EE’s one slow one – and the AA’s actually work). HKDL has finally posted a profit this year and is now a park to contend with and worth visiting. Hong Kong is one of the most dynamic and gorgeous cities on Earth, is insanely SIMPLE to navigate as English is spoken just as much as Chinese and given their superb transportation infrastructure, and should be on your must-do list as a true Disney park fan. This was my 3rd trip to Hong Kong and was glad to have experienced Mystic Point in all it’s glory. It’s still an attraction begging to be properly plus’ed in 5 years time once the park grows into it’s own. Again, they really cut some corners inside the attraction and left a ton of room for improvement down the road once the money starts rolling in. Heck, HKDL has room for a DTD, and a second gate. This will all happen…just a matter of time.